Shagya-Arabians are born riding and carriage horses. The Shagya-Arabian is a special breed which is not well known worldwide because of its rarity. The breed was developed 200 yrs ago on the famous military stud farms of the Austro-Hungarian monarchy. With its origins deriving from the purebred desert Arabian, the Shagya-Arabian breed was consolidated many generations ago so that it breeds consistently true to type. The Shagya-Arabian combines the advantages of the Bedouin Arabian, including elegant type, hardiness and toughness, endurance, easy keeping qualities, and the inborn friendliness towards humans, with the requirements of a modern riding horse - sufficient height, big frame, great rideability, excellent movement and enormous jumping ability. Gazal VII - "Stallion of the Century"
The Shagya-Arabian breed began in 1789 when the Babolna stud was founded near Budapest. 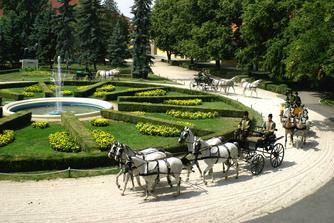 Later stud farms were formed in Czechoslovakia, Romania, and Bulgaria. 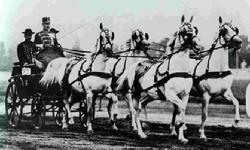 The purpose was to develop a breed of superior cavalry and carriage horses, as well as a breed which could supply prepotent breeding stallions to be used as improvers for other breeds. The Shagya-Arabian not only served as cavalry horses in many European theaters of war, they were also used as brilliant parade horses for Europes royalty. Their toughness, courage, endurance, and rideability were legendary among European horsemen. The Imperial guards of the Hapsburgs in Vienna were always mounted on elegant Shagya-Arabians. The foundation stallions of the Shagya-Arabian breed were original desert bred Arabians. They were bred with mares which showed a great deal of Arabian influence due to the long Turkish occupation of eastern Europe, as well as with Thoroughbreds, Lipizzaners, and Spanish horses to increase the size and improve movement and riding qualities. Meticulous records were kept of the breeding program in the stud books. These venerable volumes contain not only the pedigree, color, and measurements of all the stallions and mares used; they also recorded many other characteristics of the individual and of their offspring. The oldest mareline recorded is that of Moldavi, born in 1781. The major progenitors of the Shagya-Arabian breed were purchased by experts who were sent from Hungary on difficult and dangerous expeditions to the deserts of Arabia. The most important stallion to mention is the dapple-grey stallion Shagya, born in 1810. He was bred by the Bani Saher tribe of Bedouins and came to Babolna in 1836. He was such an outstanding producer that he appears in nearly all Shagya-Arabian pedigrees. He not only pressed his stamp on the breed, he also gave it his name. From the basis of the mares and stallion, the breed was further developed by carefully breeding back time and again only to desert bred and purebred Arabians. Rigorous culling coupled with performance testing and extensive progeny testing developed the sport horse qualities and genetic strength. This long term process can be traced in an unbroken line from the Shagya-Arabian of today all the way back to the beginnings of the breed. Many Shagya-Arabians have pedigrees over 20 generations long. Today the Shagya-Arabian is bred internationally, using a base of purebred Shagya-Arabian mares. Although the breed has a relatively high percentage of purebred Arabian blood, Shagya-Arabians should be clearly different from purebred Arabians in type, size, substance, and bone. The breeding goal of the Shagya-Arabian is a substantial Arab-bred horse which is suitable for everyone as an elegant riding and driving horse. The Shagya-Arabian should be beautiful and harmonious, with an expressive head, well formed neck, good topline, a long pelvis, a well carried tail, and strong, dry, correct legs. Free, springy, elastic, and correct action in all three gaits is very important. Wither height should be at least 15-16 hands and cannon bone circumference should be a minimum of 7 inches. The Shagya-Arabian should be physically and mentally capable of being a completely efficient and superior family, leisure, competition, hunting, and endurance horse. Shagyas have proven themselves successful in open competitions against warm bloods in jumping, dressage, and eventing. The Shagya-Arabian influence can be seen in many famous competitive horses including Ramzes, Condus, Burnus, Windfall, and White Girl. The 2006 WEG Endurance champion, Hungares, is a purebred Shagya-Arabian. Babolna State Stud in Hungary - home of the Shagya. 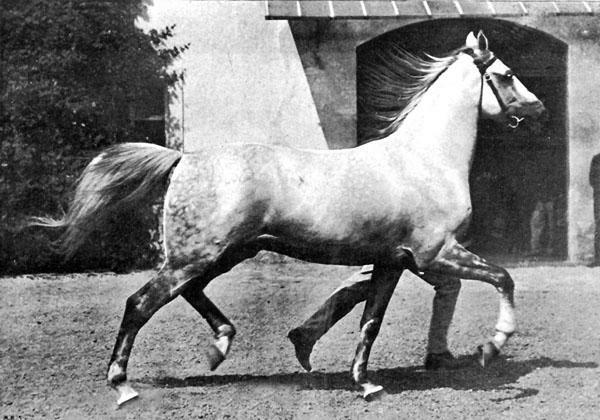 Shagya-Arabian breeding in America began in 1986. The foundation stallion was Hungarian Bravo, whose parents *Pilot and 52 Gazal II were brought to America in 1947 under the direction of General Patton as prizes of war. Bravo began his Shagya-Arabian breeding career at the age of 24, producing 3 sons and 22 daughters before his untimely death. Our mare Brook has 2 lines to this outstanding Shagya-Arabian stallion.